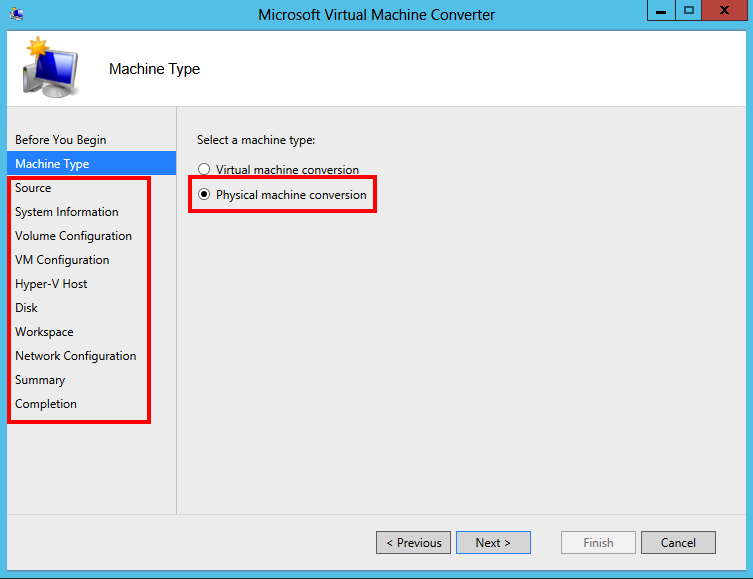 The day has come with a new version of the free conversion tool from Microsoft, MVMC 3.0 have been released. 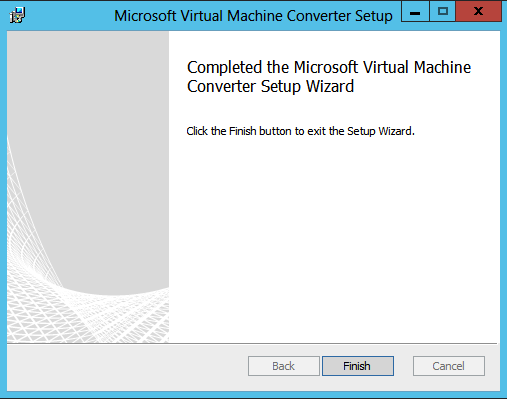 The installation is quite straightforward with the msi and just a simple wizard. Once installed You can start exploring the new options including the new P2V. 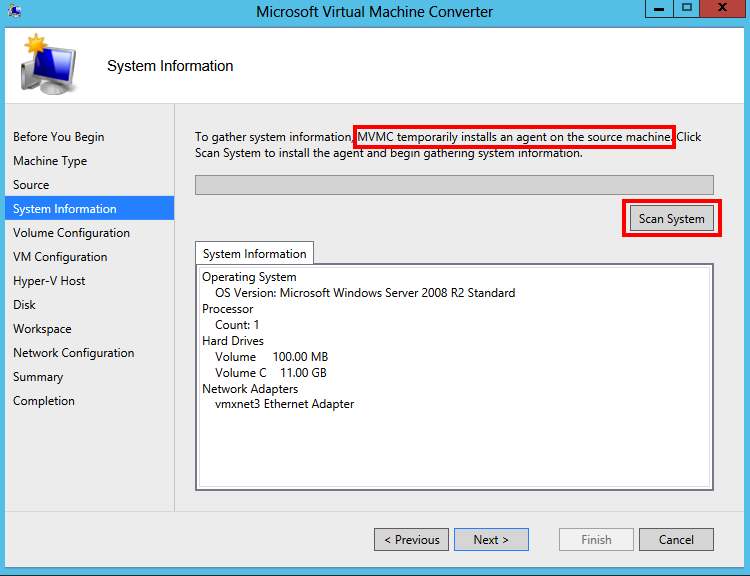 When doing a P2V the MVMC will install an agent on the source and when doing a P2V the source have to be online during the migration. Good luck in your migrations!! 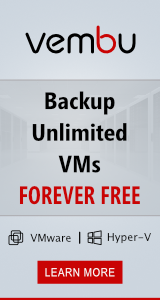 Any gotchas with a system with multiple volumes like MVMC 2.0? 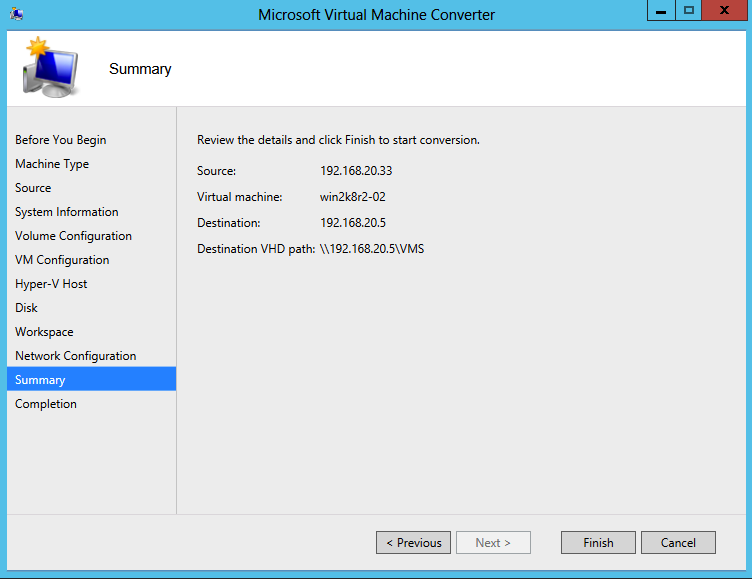 I’m still running into issues with systems that have multiple drives using MVMC 3.0. 10/17/2014 11:24:48 -05:00  VERBOSE:	Connecting to source host. 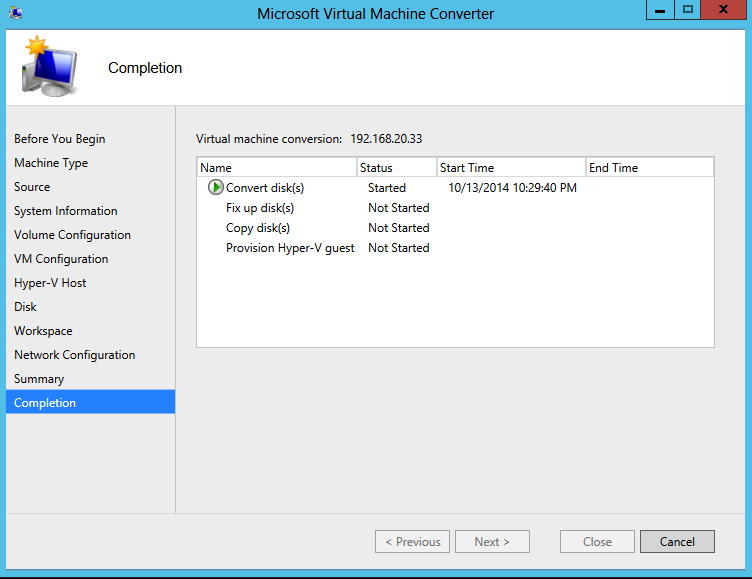 10/17/2014 11:24:48 -05:00  VERBOSE:	Querying destination Hyper-V Host OS. 10/17/2014 11:25:00 -05:00  VERBOSE:	This conversion will proceed on-line. 10/17/2014 11:36:03 -05:00  VERBOSE:	Querying source virtual machine OS. 10/17/2014 11:37:59 -05:00  VERBOSE:	Initializing (D:\V2V\MVMC\disk-0.vhdx) with a size of 128849018880 with preallocate false. 10/17/2014 11:38:00 -05:00  VERBOSE:	End of initializing (D:\V2V\MVMC\disk-0.vhdx). 10/17/2014 12:29:33 -05:00  VERBOSE:	Updating FAT/NTFS drive geometry. 10/17/2014 12:29:33 -05:00  VERBOSE:	Initializing (D:\V2V\MVMC\disk-1.vhdx) with a size of 536870912000 with preallocate false. 10/17/2014 12:29:34 -05:00  VERBOSE:	End of initializing (D:\V2V\MVMC\disk-1.vhdx). 10/17/2014 12:30:37 -05:00  VERBOSE:	System.InvalidOperationException: A task may only be disposed if it is in a completion state (RanToCompletion, Faulted or Canceled). 10/17/2014 12:30:37 -05:00  EXCEPTION:	System.InvalidOperationException: A task may only be disposed if it is in a completion state (RanToCompletion, Faulted or Canceled). 10/17/2014 12:30:37 -05:00  Exception caught : System.InvalidOperationException: A task may only be disposed if it is in a completion state (RanToCompletion, Faulted or Canceled). 10/17/2014 12:30:37 -05:00  Background task is complete. 10/17/2014 12:30:37 -05:00  Conversion error message is displayed. Same problem here but the source OS is Windows Server 2008 R2. 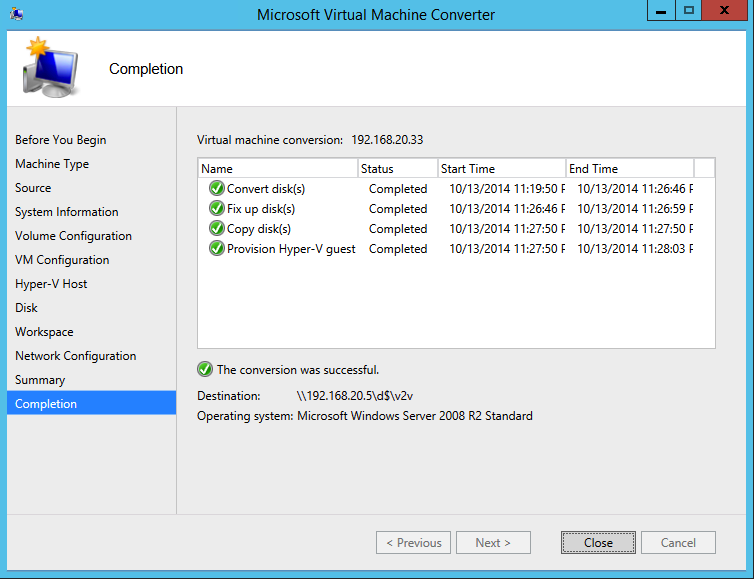 I managed to convert a Windows Server 2012 R2 guest with multiple volumes, but running into same issue with 2008 R2. Tried with GUI and powershell cmdlets but no luck. ..Problem solved by downgrading the MVMC to version 2.1, where this issue seems to be fixed. The download link for 2.1 seems to be gone, but luckily Í had downloaded it a few months ago.